The Warriors’ basketball monolith may have just gotten a lot more frightening. Golden State’s latest may-God-have-mercy-on-your-soul maneuver is to add DeMarcus Cousins to a roster that already features four of the top 25 players in the world today. Cousins signed with the Warriors for the $5.3 million Mid-Level Exception, which is significantly less than what he is worth. The Warriors are a team that could legitimately give the Eastern Conference All-Stars a fight, and Cousins’ arrival has led many to rightfully decry the competitive balance issues a move like this presents while also giving people another excuse to vent about how the Warriors are too good. But while hating the Warriors is one of America’s favorite sports, there is a fundamental problem with the argument that they are the ones ruining the NBA. For starters, let’s remember how Golden State’s unbeatable monster was formed. In 2015, the Players’ Union rejected a proposal that would have smoothed the salary cap over a number of years. The cap was set to increase from $70 million to $94 million before the 2016-17 season (due to the league’s TV rights deal with ESPN/ABC), and the NBA wanted to spread out this hike over a number of years. The Players’ Union could not have been less interested in this, because it would have prevented that year’s free agents from getting massive pay raises. The unintended consequence of it, however, was that it gave the Warriors, who were coming off a 73-win season, the additional cap room necessary to snag Durant and not have to give up any of their key players. The NBA’s worst nightmare played out in real life. This is a classic example of needing to hate the game over the player. The other problem we’re dealing with here is that, in this scenario, other teams inadvertently helped Golden State sign yet another one of the best players our world has to offer. 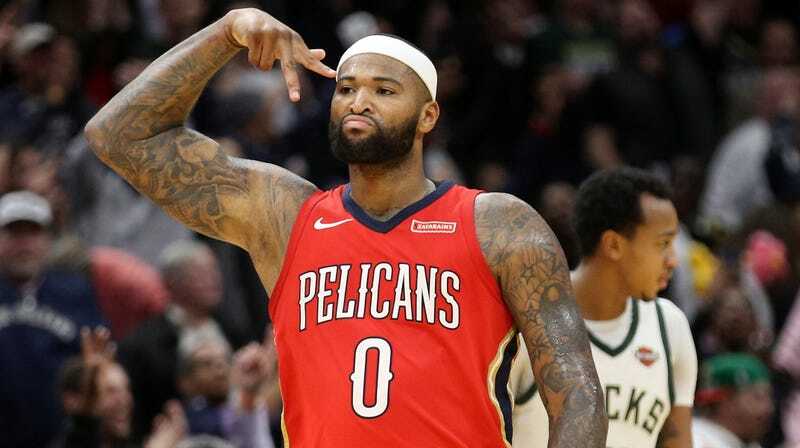 Word also reached us Monday night that LeBron’s Lakers, after signing Rajon Rondo away from New Orleans and then losing Randle to the Pelicans, had an opportunity to sign Cousins at a one-year price point similar to the one that landed him in Golden State. But I’m told the Lakers passed, clearing the way for the Warriors to infuriate the basketball public yet again. There are 29 teams in the NBA who could have had DeMarcus Cousins for less than half of what he’s really worth. There is no explanation, then, as to why Cousins got zero offers in the opening hours of free agency. Don’t get me wrong, it’s fine to be mad that the Warriors signed Cousins and, if he’s healthy, will be better than they were the past two seasons. But if you’re just mad at Golden State for picking him up when no else wanted to, you’re misplacing your anger. Ever since Kevin Durant joined the Warriors in the Summer of 2016, the team has had enough talent to toy with the NBA whenever it wants. This year has been slightly different, though; the Rockets pushed Golden State to the wall in the Western Conference Finals and very well might have eliminated them if they had a healthy Chris Paul. The Cavaliers pushed the Warriors to overtime in Game 1 of this year’s Finals behind 51 points from LeBron James. But besides these two examples, the Warriors can knock out their opponents and pick the round, too. Last night, they decided to knock out the Cavs. 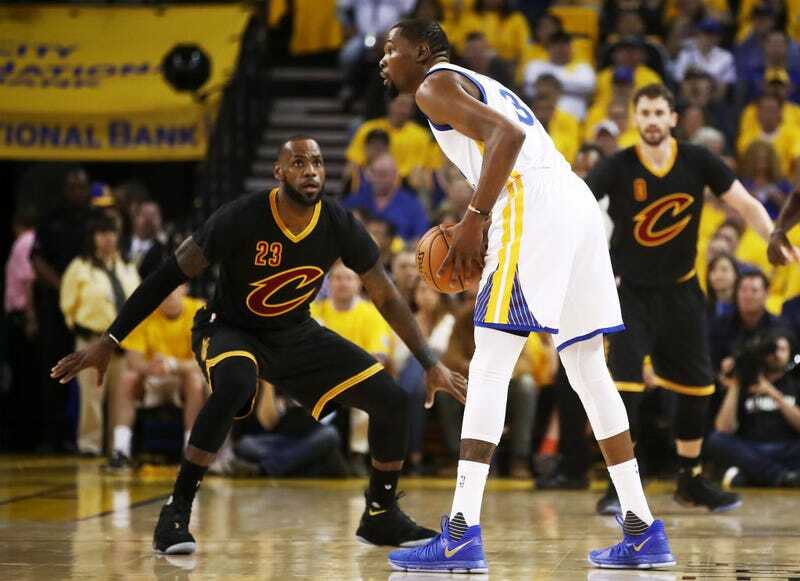 Behind 33 points and nine three-pointers from Steph Curry, 26 points on 10-14 shooting from Kevin Durant, and 20 more points from a hobbled Klay Thompson, the Warriors crushed the Cavaliers 122-103 in a game where Cleveland was only down by five before Curry and company took it over. Last night, we saw the closest thing to last year’s Warriors dominance that we have seen since, well, last year’s Warriors. Even though it appears as if Golden State lacks motivation at certain points in games, they are still far more talented than any other team in the NBA and when they put it all together, the rest of the league gets put on notice. That’s what happened last night. Keep in mind that the Warriors are doing this without Andre Iguodala, who is recovering from a bone bruise in his knee and has not played since Game 3 of the Western Conference Finals. While Iguodala may not necessarily seem like one of the most important figures in the Warriors’ dynasty, he absolutely is, and their occasionally absent-minded play without him should be proof of that. He one of the few people on Earth willing and able to consistently defend LeBron James, and if he returns in this series (which he might), the Warriors have a better chance of containing LeBron. Until then, however, it will likely be either JaVale McGee or Kevon Looney occupying the final starting spot for the Warriors. Both men are capable bigs, but neither has the ability to guard James or space the floor on the offensive end. The Warriors, after starting Looney for the five previous games, decided to go with McGee in the starting lineup last night, and even though he had a +/- of 0, the move seemed to pay dividends; McGee had 12 points and most of his action came under the basket when the Cavaliers’ defenders were more preoccupied with Golden State’s three-point shooters. Whether you take McGee seriously or not, he is a live body who can cause havoc on the glass and makes the most of his opportunities in close. That’s all the Warriors need him to do until Iguodala returns from injury. And think about the luxuries that Steve Kerr has with a team this versatile and talented. On the other side, Cavs coach Ty Lue doesn’t have nearly as many good options to go to off the bench (for instance, it’s more difficult for Lue to put Kyle Korver on the floor against a Warriors lineup looking to attack any defensive mismatch the Cavs have to offer). And, instead of having a steady presence like Shaun Livingston coming off the bench, Cleveland has Jordan Clarkson, who has shot 3-13 in the first two games of the series and makes multiple ill-fated attempts to take over the Cavs’ offense when he steps on the floor. But instead of maligning all of the matchup problems the Cavaliers have in this series, it’s more important to look at what the Warriors have done right. That can be boiled down into one player: Steph Curry. Last night, Curry broke an NBA Finals record last night by hitting nine three-pointers; he finished with 33 points but his impact goes beyond his scoring. The psychological impact of his hot shooting, particularly at Oracle Arena, cannot be quantified. And there is something to be said for the blow an opposing team takes when they play masterful defense for 23 or more seconds, only to have Curry drain a turnaround fadeaway from five feet behind the line. When you add that to the individual talents of Durant and Klay Thompson, the Warriors offense becomes virtually unstoppable when it’s clicking. There should be at least a slight momentum shift when the series heads back to Cleveland for Game 3. But the Cavaliers will almost certainly need to win both games at Quicken Loans Arena to have a chance in this series; even though LeBron James and the Cavaliers have come back from a 3-1 deficit in the Finals before, there’s a reason it’s only happened once since 1947. Even with the greatest player in the history of the league on their side, Cleveland will have a very difficult time coming back against the most talented team the league has ever seen. That team is the Golden State Warriors. Even though they’ve had their trials and tribulations throughout the season, we always knew that they could flip the switch and play to their dominant, ruthless potential whenever they wanted to. They did that last night, mainly with the help of their two-time league MVP. Oh, by the way, they may very well get the ex-Finals MVP they have lying around back before this series ends. The Warriors have returned. Maybe they never really left. Either way, the NBA’s sleeping giant is awake, alive, and humming on all cylinders. That usually doesn’t end well for anyone in its way. There is a pantheon of dumb plays in the history of both college and professional basketball. It has some awesome entries; Chris Webber trying to call timeout when his team didn’t have one, Rasheed Wallace leaving Robert Horry wide open to lose Game 5 of the 2005 Finals, and JaVale McGee’s entire career. These moments, whether they come in the regular season or the biggest games of the year, are the reason why “Shaqtin’ a Fool” exists. But aside from the occasionally brain dead moments that happen during a basketball game, these are some of the best players in the world. They always get the basic stuff, like the time and score of the game, correct, and they know how to react depending on the game situation, right? Right? There is so much wrong with whatever happened there. First of all, George Hill is an 80% free throw shooter for his career and should have made the free throw. When Smith gets the rebound, he has the opportunity to lay it in, albeit over a 6’10” Kevin Durant, to give Cleveland the lead. When he pulls the ball out to the three-point line, the Cavaliers should have called timeout. Instead, none of these things happened and Cleveland didn’t get a shot off in the final 4.7 seconds. And, after all of the stupid things you read in the last paragraph, you would think that it doesn’t get any dumber than that. I’m here to tell you that it does. The only possible explanation for whatever it is Smith did in the closing seconds of the fourth was that he didn’t know the score and thought the Cavaliers were winning. Cavs coach Tyronn Lue seems to believe that’s the case; after the game, he said that Smith thought his team was ahead and tried to run out the clock. Smith, on the other hand, insists that he knew the game was tied at 107 and thought Cleveland would take a timeout. Choose who you want to believe in this situation, but Smith has made dumb plays in crunch time before, and that particular instance involved another episode of scoreboard amnesia. Therefore, I have to go with the guy who got stepped over by Allen Iverson over the guy who threw soup at one of his coaches. It’s just that easy. As much as we should all collectively laugh at this, however, it is one of the most costly blunders in recent Finals history, and it may have cost the Cavs any chance they had at winning this series. Despite all of this, the Cavaliers lost in overtime. There were some breaks that didn’t go their way, like a controversial foul towards the end of the game on James that was changed to a block from a charge on Durant. After the game, Lue voiced his displeasure with the call, and even though it was a bang-bang play, he has a right to be upset, as foul calls are usually not up for review. However, the Cavaliers should not, in any way, blame last night’s defeat on poor refereeing. They had a chance to make a free throw, then they had a chance to get a basket, then they had a chance to call timeout to draw up a play to get said basket, and they somehow managed to do none of those things despite the odds being, for once, in their favor. For Cleveland fans, that is the shame of what transpired last night. The Warriors are decidedly more talented than the Cavaliers but did not play their best game last night. The underdog had a chance to take out the favorite last night and put the defending champs in a 1-0 hole. They couldn’t get the job done, and even with the best player in the world performing at quite possibly the highest level of his career, the Warriors still found a way to pull it out. Before this series, I picked the Warriors to win in five games. One of the ways Cleveland could have dragged out this series would have been by winning the first game and stealing some momentum out of Oracle Arena. 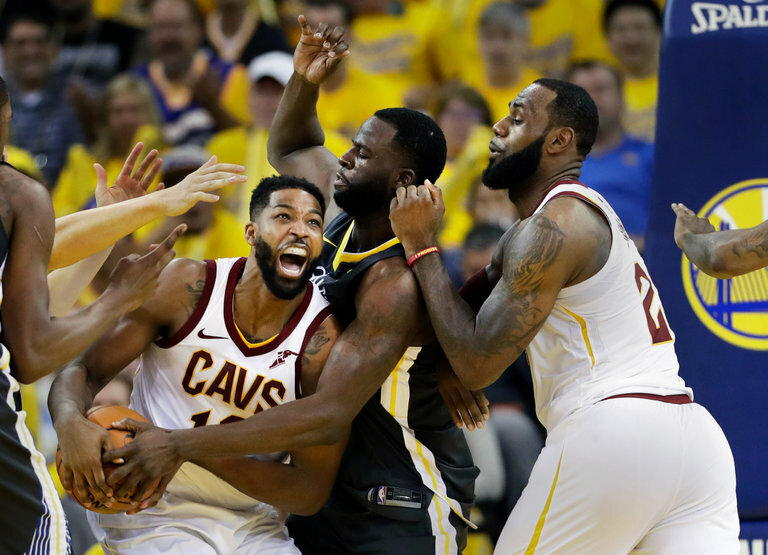 Granted, they could still win Game 2, but against one of the all-time great teams in NBA history, it’s very difficult to win a seven-game series after allowing a golden opportunity like last night’s to slip through your fingers. Let’s also remember that Smith, who blew the end of regulation, took an unnecessary gamble on a Curry heave at the end of the first half. It cost Cleveland three points and made a significant difference between them winning and losing the game. What caused a bigger difference, though, were the events that took place in the final five seconds of regulation. But when you think about who had the ball, it’s not a surprise. And thanks to J.R. Smith losing his counting skills and critical thinking powers, the Cavaliers’ margin for error in this series has gotten even smaller. It is no secret that the Cleveland Cavaliers have the best basketball player on the planet. It’s also not exactly private knowledge that the supporting cast they’ve given him is far from championship-caliber. But despite trading point guard Kyrie Irving before the season for a pile of misfit toys, completely overhauling their team at the February 8 trade deadline, and having their newest players provide very little of anything constituting good basketball, the Cleveland Cavaliers are two wins away from the fourth straight NBA Finals appearance. You’ve probably heard this one before, but the Cavs’ success has absolutely everything to do with LeBron James and nothing to do with anything else. But it’s not just that James is single-handedly trying to will his team to another NBA Finals. It’s that he is doing this at a level of play we may very well have never seen before in the history of the sport. For starters, James is averaging 33.7 points, nine rebounds, and 8.7 assists per game in these playoffs. The only player in NBA history to match those figures in the postseason was Russell Westbrook last year; the kicker here is that Westbrook’s Thunder were bounced by the Rockets in five games in the first round of the playoffs. We have never seen a player produce this consistently over a full playoff run, but the raw production numbers are not the only sign of James’ historic greatness. Because while some players have been insanely prolific scorers, passers, and rebounders throughout NBA playoff history, no player has ever done all three of these and combined them with ruthless efficiency. There have been two postseasons in NBA history in which a player has owned a PER (Player Efficiency Rating) of 33 or greater and player in at least ten playoff games. LeBron James is the owner of both of them (NOTE: PER was not tracked until the 1988-89 season). Not Michael Jordan, Magic Johnson, Tim Duncan, Kobe Bryant, Kevin Durant, Dirk Nowitzki, Karl Malone, John Stockton, et al. Just LeBron James. Just the greatest player of our generation. Just the greatest player of all-time. The Cavaliers, though, are in a similar position to where they have been in the previous two playoff series. They’re playing a Boston Celtics unit that, as a whole, is probably better than they are. The same statement could be made about the Indiana Pacers, who pushed Cleveland to the wall in the first round and outscored the Cavs by 40 points over seven games. The Toronto Raptors could, theoretically, have given the Cavaliers a series, but they blew a 14-point lead in the first half of Game 1 and, on account of them being the Toronto Raptors, lost the next three games and even had ESPN announcers saying that they hailed from “LeBronto”. Now that is rock bottom. The Celtics, though, are the best team Cleveland has faced to this point in the playoffs. In spite of losing their two best players, Gordon Hayward and Kyrie Irving, to season-ending injuries, Boston has the best defense in the league and an ensemble cast that has carried them past the Bucks and 76ers to the Eastern Conference Finals. However, they depend on getting much of their offense from rookie Jayson Tatum, second-year player Jaylen Brown, and 2015 first-round pick Terry Rozier. The only experienced veterans currently playing for the Celtics are Al Horford and Marcus Morris, and while Horford made the All-Star team this year, he isn’t nearly the type of player James is and the Celtics depend just as much on their young players for production. It’s fair to wonder whether or not these three men can regain their mojo as the series returns to Boston for a critical Game 5. The reason this is brought up now is because the Celtics have just one road win in these playoffs, and it came in overtime against the 76ers in a game that nearly ended with a Philadelphia victory in regulation. The Celtics obviously have a better supporting cast, but against a player like James, will it matter? My belief is that if Cleveland gets good enough contributions from the likes of Kyle Korver, J.R. Smith, Tristan Thompson, and Kevin Love, the answer to the question above will be no. You go into this game assuming that James will take what is his, and even if he has a bad night from the field, he’ll still set his teammates up with good looks. Cleveland shot 25-57 (.439) from three in two games at Quicken Loans Arena as opposed to 14-57 (.246) in two games at TD Garden. There may be some regression from Game 4 to Game 5, but if the Cavs continue to get open looks, at least some of them are bound to go in. The other factor here is the Celtics’ ineptitude on the road. Even though they don’t need to win a road game to win this series, they are only forcing LeBron and company to take one game in Boston assuming their home/road trends continue. Remember, this is the same building in which LeBron dunked Jason Terry into next week and scored 45 in an Eastern Conference Finals elimination game. If tempting fate is your thing, the Boston Celtics are the team for you. But no matter what happens, we should sincerely appreciate what we are watching on the court on a nightly basis. The greatest player in the history of basketball has been given one of the worst secondary units in the league, and despite that, he may lead this group make to their fourth straight NBA Finals and his eighth in a row. And if you think your profession is miserable, just remember that mine pays a guy $5.5 million per year to go on television, troll LeBron, and tweet out dumb things about him every time he does something good, which is very often. The greatest basketball player of our generation and the greatest player of all-time has brought the Eastern Conference Finals to a tie at two games apiece against a collective unit that is evidently far better than his. He doesn’t have a very good supporting cast and the odds are that he can’t singlehandedly drag his team to another NBA Finals. But who needs favorable odds when LeBron James is on your team? The Cavaliers haven’t before, and they certainly don’t now. Just How Far Can the Houston Rockets Go? The Houston Rockets have been the NBA’s hottest team through the first two months of the season and currently hold a Western Conference-leading 25-5 record. Until last night’s loss to the Lakers, one in which MVP candidate James Harden casually dropped 51 points, the team had won 14 games in a row and had also gone 15-0 with point guard Chris Paul in the starting lineup. Paul, though, left last night’s game with an adductor strain and is currently considered day-to-day. Now that we enjoyed that little bit of fun, it’s time to return to reality and consider whether or not the Rockets can seriously stack up with the Warriors if the two meet in the playoffs. In reality, though, this shouldn’t be that much of a surprise. Paul has been a plus/minus god for the better part of ten years and is, for my money, one of the three best point guards in the game today. That makes his injury last night, the second significant one he has suffered this season, all the more concerning. While he isn’t expected to miss much time at the moment, the Rockets cannot possibly win a championship without him. After all, we’ve seen what can happen to the Rockets in the playoffs without him and it wasn’t pretty. All that being said, this is not at all an affront to James Harden’s abilities. It is, however, a testament to the state of the NBA today that having just one of the best players in the league is not nearly enough to get a team into serious championship contention. The other problem for the Rockets last season was that Harden, without the presence of a true point guard, played the position admirably and nearly won Most Valuable Player honors. The issue was that, by the time the Rockets faced off against the Spurs in the Western Conference semifinals, Harden was asked to create his own offense and initiate most of Houston’s, as well. He barely shot over 41% in the series and the Rockets were dispatched despite the Spurs’ loss of star forward Kawhi Leonard at the end of Game 5. The Rockets don’t have that problem anymore, and while Harden can put the team on his back for periods when Paul is injured or on the bench, the team hopes that they won’t completely need him to come playoff time. Since we seem to keep coming back to it, let’s address this next issue head-on. Can the Rockets dethrone the defending champions and beat the Warriors in a playoff series? For starters, let’s take a slightly closer look at the performance of both teams to this point in the season. The Dubs are currently just a half-game back of Houston for the top spot in the West, and while much of the attention has gone to the Rockets’ start, the Warriors have ripped off 25 wins in their first 31 games with little to no fanfare. And you could argue that Golden State has not yet hit its stride, as superstar point guard Steph Curry will be out until the end of this calendar year with an ankle injury. Simple Rating System, a statistic that rates teams based on point differential and strength of schedule, has the Warriors and Rockets rated just about identically, with Golden State holding the advantage by one one-hundredth of a point. If you want to be skeptical of this metric, you have my full permission; it currently has the Raptors rated as the top team in the East and made the exact same mistake a season ago. But while it may not be perfect, it does take into account most aspects of a team’s performance and gives a number correspondent to the strength of that performance. And according to SRS, the Rockets’ success has been impressive, but it still isn’t enough to put them past the Warriors as the Western Conference’s best team. There is also no guarantee that the Rockets will keep up this pace, one that has them winning 83% of their games, for the rest of the season. While the Rockets’ offense shouldn’t be a problem as long as Paul and Harden are healthy (they currently lead the league in offensive rating), their defense could become a concern. A team coached by Mike D’Antoni for a full season has never finished in the top ten of the league in defensive rating; the lockout-shortened 2011-12 New York Knicks, a team D’Antoni resigned from with 24 games to play in the regular season, finished fifth in that category that year. The Rockets currently sit in 7th in the league in defensive rating, and while this may very well be the best team he has ever had in his coaching career, there is also reason to believe that their defensive performance could suffer as the season goes along. I truly want to believe that the Houston Rockets could dethrone them as the best team in the NBA. I really believe that they are the second-best team in the league right now, and I don’t see that changing, barring injuries or unforeseen circumstances, before the season ends. But I’ll believe in the Rockets as a championship contender when I see the Warriors lose a playoff series. I wouldn’t bet on it. Well, at least until tomorrow. This week marks the only time in the calendar year in which no professional sports games will be played. It’s a slow news week and at this point, it seems like we’re almost inventing news to get us through it. Think about that story: a player took his franchise’s ineptitude into account, as well as the sport’s inherent health risks, when deciding whether or not to keep playing football. No, never! Anyhow, it’s not the best week for new developments in the sports world. The debate over who is truly the best basketball player of all time, a debate that can be narrowed down to just two players: LeBron James and Michael Jordan. You’ve probably heard the crazier, louder, and most controversial opinions on this subject. From our flawed memories to the supposed clutch gene, we’ve heard just about every possible opinion on this subject. It’s not that these opinions are bad or even wrong, but they do become tiring after a while. Once the discussion reaches a certain point, it feels like the same facts (or opinions) are being regurgitated and we try to come up with new, more interesting, and more controversial ways to address this matter. Anyone who makes a sincere argument about James’ legacy compared to Jordan’s clearly doesn’t understand just how much basketball has changed over the past 20 years. These people also don’t understand that the two men are completely different players who do completely different things on the court. LeBron has always been aware of this, thankfully. Sure, the game of basketball has changed over the past 20 years. And I’d like to think that I’ve become less of a sarcastic, angry curmudgeon over the past thirteen months (wishful thinking). So I decided to further investigate some things myself, and even I must admit that I was surprised by just some of what I found. For all of my life, I had always assumed that Jordan was better, but I gave myself a serious self-examination to discover why I held that opinion and whether or not I was right. I decided that I was going to examine this analytically and accept that I may not expect the outcome I would eventually come to. I was jumping in on the hottest debate in sports. For starters, most everyone agrees that James is a better passer than Jordan. This is certifiably true; not only does James (7.0) average more career assists per game than MJ (5.2), LeBron’s 35.0% assist percentage easily outshines Jordan’s (24.9%). Okay, we’ll give this facet of the game of basketball to LeBron. As long as Jordan isn’t hurting his teammates on the offensive end, it shouldn’t be that big of a deal, right? As many will tell you, the absolute worst thing you can possibly do with the basketball is turn it over. In the case of an unskilled player like me, the worst thing you can do is shoot it, but that’s an entirely different conversation. Anyway, James has, as you would expect, more turnovers per game than Jordan. Again, this is over the course of both players’ full careers, so everything they have done is being factored in. Take a closer look at that number, though, and you’ll see that it isn’t as black-and-white as it may seem. Sure, James averages more than three turnovers per game, but as we pointed out earlier, he also gets about seven assists. In terms of career totals, James’ assist-to-turnover ratio is about 2.06. Jordan, who obviously passed the ball less in his day, has an assist-to-turnover ratio of roughly 1.93. At this stage, I should point out that I won’t be counting Jordan’s comeback season in 1995, one in which he played just 17 regular season games. While much is often made of James’ turnovers, particularly in the playoffs, the problem is actually overblown in the regular season. If you take James over Jordan, you’re getting an extra 106 assists in exchange for just over 36 more turnovers. Wouldn’t you take that literally every single time? I know I would. If you place a lot of import in playoff statistics, like I also do, you’ll notice that these numbers are slightly different. James’ assist-to-turnover ratio dips to 1.93 while Jordan’s hovers around 1.87. While both players are down, James is still slightly better. If you hitch your wagons to playoff LeBron and ditch playoff Jordan, you’re signing up for 45 more assists and 22 more turnovers. Again, you’d take that trade-off. Another common knock against James’ overall game is his shooting ability. For some reason, many have made LeBron’s “inability to shoot” their justification for knocking him as a player. So of course Jordan’s shooting numbers have to be better, right? Actually, that’s not necessarily the case. What if I told you that James has better career percentages on both two-pointers and three-pointers? That would probably shock you, right? Well, it’s true. While Jordan has a better field goal percentage in the playoffs, James actually has a better true shooting percentage; true shooting percentage, or TS%, is a measure of every “shot” a player takes over the course of a game or a season (twos, threes, and free throws). The numbers state that James is kind of, sort of a better shooter than Michael Jordan. Funny how that happens. Now, many Jordan zealots will point to his scoring numbers (three more points per game in the regular season and five more in the playoffs) as a way to essentially stiff-arm these critiques. But in the playoffs, Jordan is able to pull off these numbers by taking over four more shots per game (in the regular season, it’s just over three extra shots per contest). Those numbers, then, are not as impressive when you consider how much harder he has to work for them. That isn’t meant to be a knock on Jordan’s offensive prowess but it does put both players’ scoring ability into context. There’s one more thing to think about here: Jordan appeared in six NBA Finals and LeBron has appeared in eight. While most will take this time to point out that Jordan has six rings as opposed to James’ three, the fact that James has been to eight Finals total and seven in a row speaks to how consistently good he has been. Of course, if Jordan didn’t take the better part of two years off to play baseball, he may have matched or even surpassed this feat. And while Jordan has a 6-0 record in the Finals, he also lost to other Eastern Conference teams in the playoffs in the earlier stages of his career. That should also factor into his playoff greatness, whether you like it or not. This is the question: would you rather lose early in the playoffs or get to basketball’s biggest stage and then succumb to a simply better team? That’s pretty much what you’re saying if you bring up Jordan’s Finals record as the be-all, end-all answer in the debate between these two titans of basketball. If you are a regular reader of this blog, you probably know that I am something of an advanced stats nerd. Advanced analytics, particularly in basketball, place everyone on a level playing field and make all things virtually equal. This next section may bore you, but it is arguably most significant when comparing both players. One of the main statistics used to evaluate players in basketball is Player Efficiency Rating, or PER for short. In that category, Jordan is slightly ahead of James (27.9 to 27.6). The distance between these two players, the top two in the history of the NBA in PER, and the third-place player (Shaquille O’Neal) is sizable. Jordan and LeBron are the two best players in this all-encompassing category, but we’ll cede the high ground to MJ on this one. The more revealing stat in this debate is Value Over Replacement Player, otherwise known as VORP. VORP essentially tries to quantify just how much better (or worse) a player is than just about any other replacement player in the league in terms of points per 100 team possessions added (or subtracted). It is basically basketball’s answer to Wins Above Replacement. You get it, I VORP. I’m sorry. I had to throw that in. Back to the matter at hand now. Just like with PER, both players are in the top two all time (it should be noted that these rankings also encompass the ABA). This time, though, James finds himself on top (115.9 to Jordan’s 104.4). While career PER is an average of a player’s efficiency rating over the course of his career, VORP is a statistic that accumulates as a player racks up more career minutes. So surely, upon seeing this, you would think James has played significantly more career games and minutes than Jordan, right? Well, it’s not exactly that way. James has played 41,272 career regular season minutes. Jordan has played 41,011. The difference in service time between the two all-time greats? 261 minutes, a difference that Jordan would have compensated for in roughly seven games. Another similar measure of a player’s success is a stat called Box Plus/Minus (BPM). Box Plus/Minus is almost identical to VORP, except that it attempts to quantify the contributions of a player per 100 possessions while he is on the floor. BPM, just like PER, is an averaged statistic and is not dependent on minutes played. James and Jordan possess all three of the greatest BPM seasons of all time, but James has a slightly better BPM than Michael (9.1 to 8.1). There are also separate calculations for offensive and defensive BPM. LeBron has the advantage in both figures. Advanced statistics have spoken. They say that LeBron James is the greatest basketball player of all-time. This is a debate that you could spin yourself in knots with. There are legitimate arguments to be made for both players and it’s hard to find blame with any opinion… as long as it makes logical sense, of course. To tell you the truth, I’m still not entirely comfortable having this conversation, as Jordan’s second retirement came just under four weeks before my birth. I’m also not comfortable with some seemingly downplaying Michael Jordan’s impact on the game of basketball, as he came into the league when NBA Finals games were broadcast on tape delay and left the sport of basketball as the second-most popular sport in the United States. That being said, this discussion is simply about which man is the better basketball player and, by extension, the best basketball player ever. My careful study of the numbers shows that LeBron James has a slight but clear advantage. Gordon Hayward is shipping up to Boston. The former Utah Jazz forward will sign with the Celtics on a 4-year, $128 million deal, with the fourth year being a player option. Hayward is the asset Celtics GM Danny Ainge had wanted all along, and he didn’t have to give up any of his precious assets to get the best free agent on the market. This, ultimately, was Boston’s endgame; save the team’s stockpile of draft picks and most of its key pieces to acquire Hayward, who just last year was a 10-win player for the Jazz and a top-15 player in the league, having earned career highs in points and rebounds. One would figure that Hayward’s decision would significantly change the balance of power in the Eastern Conference. If this is your opinion, you may want to seriously rethink it. In order to make room for Hayward on their roster, the Celtics are expected to trade any one of Jae Crowder, Avery Bradley, or Marcus Smart; rumors are that the front office is looking to jettison one of the three players to Utah in a sign-and-trade to acquire Hayward. The most likely scenario is that Crowder is traded, as he would likely be cast as an undersized power forward in Boston’s new offense. However, his loss would be a bitter pill to swallow; Crowder ranked second on the team in win shares (6.7) last season and third in value over replacement player. While he probably wouldn’t be as productive if he stayed in Boston, don’t think that the Celtics are losing nothing if they trade him. Advanced statistics are not as friendly to Bradley or Smart, but the former was Boston’s second-leading scorer a season ago and the latter was the team’s sixth man. If it were up to me, I’d trade Marcus Smart; he only shot 36% from the field last season and just over 28% from deep. Smart, though, is one of the best defensive players on the team (tied for first in defensive win shares) and his departure would likely force Terry Rozier to step in as the Celtics’ backup point guard. While acquiring Hayward is definitely worth it for the Celtics, the team will likely be faced with non-trivial losses after his signing becomes official. While the Celtics were the No. 1 seed in the Eastern Conference a season ago, their Pythagorean win-loss record says that Boston should have been 48-34 based on last season’s point differential of +216, or +2.6 points per game. Let’s say that the Celtics send Crowder to Utah in the sign-and-trade. In terms of win shares, the Celtics are getting a +3.7 net change, but if you take that number and add it to their expected win-loss record and not their real one (53-29), the team would finish at 52-30. Granted, this does not take the overall fit of either player into account, but it does provide a starting point to figuring out just how much better Boston is with Hayward’s addition. Personally, I’d say that the Celtics are about three wins better than they were last season if they don’t trade Crowder. If they do, they’re probably right back where they were a season ago, even though their roster is more talented and, simply put, better. 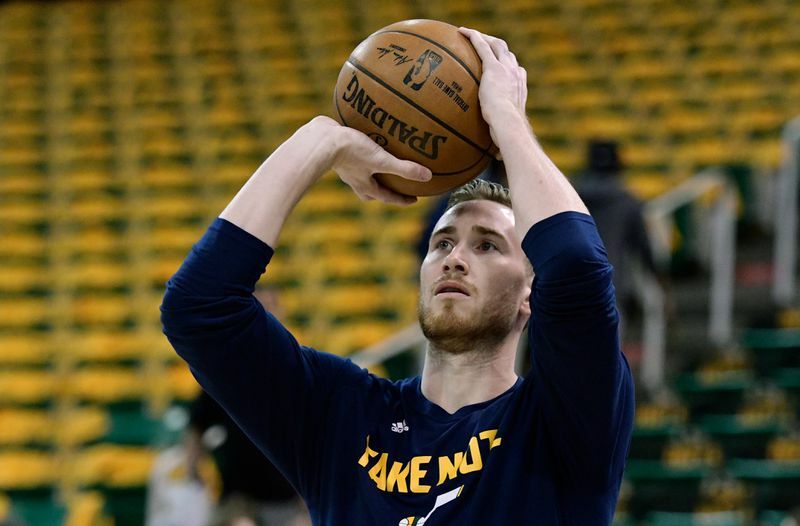 The team is due for a market correction after essentially stealing an extra five wins last season, but Hayward will help them once he gets acclimated to his new surroundings. Remember when I told you that Hayward was worth just over ten wins for the Jazz last season? Well, that isn’t the important thing when considering his move. The main question to ask yourself is this: is Gordon Hayward worth an extra three wins in late May? That’s the amount of wins the Celtics would have needed to get past the Great Wall of LeBron in last year’s playoffs. Even with one of the luckiest and most surprising wins in NBA playoff history, Boston was absolutely no match for the James-led Cavaliers in last year’s Eastern Conference Finals. Does the acquisition of a player like Hayward push the Celtics over the edge and past the Cavaliers? My guess, at least for next year, is that it doesn’t. It does make things more interesting, but it’s unlikely that Hayward instantly makes the Celtics the best team in the Eastern Conference; after all, the Celtics were immolated to the tune of a -100 point differential in last year’s Conference Finals, one that lasted just five games. Now, Hayward’s signing is not solely a play towards 2018. The Celtics, assuming Ainge can re-sign star point guard Isaiah Thomas next year, are squarely in position to ascend to the Eastern Conference throne should James begin to decline (he turns 33 in late December) or leave the Cavaliers after next season. From that point of view, the acquisition is very smart; Boston gets a star player while giving up relatively few assets to do so. However, those picking the Celtics to win the East next year are probably at least a year ahead of themselves. Of course, Hayward’s move isn’t the only significant development in this year’s free agency window. Let’s take a look at what’s been going on in the Western Conference, shall we? In my view, the most significant move out west was the Minnesota Timberwolves’ draft day acquisition of Jimmy Butler from the Chicago Bulls. Chicago, for reasons passing understanding, only took Zach LaVine, Kris Dunn, and the seventh overall pick (Lauri Markkanen) from Chicago for a player who ranked in the top fifteen in both offensive and defensive win shares last season. Then, Minnesota signed Indiana Pacers (more on them later) point guard Jeff Teague and dealt Ricky Rubio to Utah. While the two are similar players, Teague is a slightly better shooter and, by extension, a slightly better floor-spacer for an offense that will likely run more isolation sets for Butler. Also, the addition of Butler should help budding stars Andrew Wiggins and Karl Anthony-Towns, both of whom are just 21 years old. Butler’s arrival should be beneficial to Wiggins, in particular, as he struggled mightily on defense last season. For added measure, the team later signed power forward Taj Gibson to play alongside Towns in the paint. Here’s the catch, though: the most transformative acquisition of the past two weeks came to a team that finished 31-51 last season. While their Pythagorean win percentage says they should have won seven more games than they did, the Timberwolves have a ways to go before becoming a serious championship contender. While the Celtics can at least see the light at the end of the tunnel with the Cavs’ dominance, there still exists a gulf between Minnesota and the Golden State Warriors. And Golden State doesn’t have aging superstars who are likely to leave the team anytime soon. So while Butler makes the Timberwolves a lot better than they were, he shouldn’t be enough to make the difference between them and the Warriors. Another huge trade in the West was the Oklahoma City Thunder’s acquisition of Pacers forward Paul George. George announced shortly before the deal that he had absolutely no intention of re-signing with Indiana when he becomes a free agent in 2018. This left team president Kevin Pritchard between a rock and a hard place; trade George and receive less than he should in return or keep George for one more year and let him walk, likely to the Los Angeles Lakers, next summer. Pritchard decided to cut his losses and deal George to Oklahoma City in exchange for Victor Oladipo and Domantas Sabonis. George is a legitimate star in today’s NBA, and his numbers would suggest that the Pacers should get far more than they did in the trade. However, his preemptive decision left Pritchard with no good alternatives, so trading him for far less than market value was probably his only move to get himself out of check with his superstar. While many observers have chided the Pacers for getting fleeced in the deal, they had very few good options in this situation. They should be let off the hook just for getting anything at all for George’s services. George, by all standards, is a very good player. He had a career year last year and has averaged over 20 points per game in each of the last three full seasons he has played. Where he has struggled recently is with his defense, as he accrued a negative defensive box plus/minus rating last season. This year, though, he’ll be playing with Russell Westbrook, the league’s reigning MVP. Chances are that he won’t be carrying all of the offensive load like he did with Indiana last season, thus giving him more energy to spend on defense. The two should have a symbiotic relationship next season, and while Westbrook probably won’t be averaging a triple-double next season, the addition of a player like George will take some of the burden from both players. That being said, the Thunder won just 47 games a season ago. They were the No. 6 seed in the Western Conference playoffs and were bounced in an exciting but anticlimactic five games by the Houston Rockets in the first round last season. While the Thunder will try to keep George after next season, the Lakers are still the favorites to reel him in next summer. And even with him, the Thunder are likely not good enough to make a serious run at a championship this season. While George is an objectively excellent player, he shouldn’t move the needle enough to push the Thunder past the Warriors. The one team that can claim to have a fighting chance at winning the West next season is the Houston Rockets. The team acquired star point guard Chris Paul from the Los Angeles Clippers in a monster trade that included the Rockets sending seven players back to L.A. The numbers, though, suggest that the hefty price Houston paid (Lou Williams, Patrick Beverley, Sam Dekker, others) is more than worth it; Paul contributed just under 11 wins to the Clippers last year in all of 61 games. Even at 32, Paul is still one of the best point guards in the league, and his addition could very well make the Rockets the second best team in the Western Conference. While some have made the argument that Paul and superstar James Harden will struggle to coexist because, as they say, there is only one basketball, the Rockets now have two of the best guards in the game. Somehow, I’m inclined to think they’ll make it work. But, again, can they beat the Warriors? Paul has never been to the Conference Finals and the Rockets couldn’t even get past the Kawhi Leonard-less Spurs in Game 6 of the conference semis last year. In a vacuum, this move would likely make the Rockets the title favorite next season. Instead, Houston will have to contend with the monolith that is the most talented basketball team ever assembled. And also, the Warriors will be even more absurd than they were just last year. In free agency, the team has added shooters Omri Casspi and Nick Young (yes, that Nick Young) to their already-loaded bench. Meanwhile, they have also managed to keep all of their core pieces intact while making their roster even better than it already was. If a team is going to catch the Warriors for the NBA title next season, I haven’t found it yet. While CP3 makes the Rockets significantly better, Houston would need several things to go right for them to get past Golden State. Many important moves have been made in NBA free agency and trades in the last few days. Several teams have gotten better this month, such as the Thunder, Celtics, Timberwolves, and Rockets. We haven’t even gotten to mention the Denver Nuggets, who will be a ton of fun next year after signing power forward Paul Millsap to a 3-year, $90 million deal. Also, the Sacramento Kings are pushing toward playoff contention (don’t laugh) with the signings of George Hill and Zach Randolph, as well as the drafting of Kentucky’s DeAaron Fox with the fifth overall pick in the draft. Many NBA teams have gotten better over the past couple of weeks. Unfortunately for them, the moves made this June and July likely won’t make much of a difference come next May and June.